• 3D Living World – Detailed environment where animals roam and smoke billows from small huts, set in a vibrant colorful world. • Innovative Features – Great People, Holy Cities, missionaries, variable game scales, new land, sea and air units, and loads of new civics. • New Leaders & Civilizations – More of history’s greatest military leaders including Shaka, Wang Kon and Augustus Caesar, plus six all-new civilizations. • New Scenarios – Eight new scenarios including Alexander’s Conquests, the Rise of Rome, Genghis Khan and more! 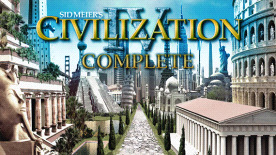 • The Biggest Civ Expansion Ever – A massive increase of 10 civilizations, 64 buildings, 11 scenarios, 5 wonders, 6 technologies, corporations, brand new espionage system and expanded trade routes. • Scenarios — Expect the Unexpected – 11 additional scenarios include settling new worlds in Final Frontier, battling zombies in Afterworld, conquering medieval Western Europe in Charlemagne and more. • Classic Game Design – The strategy classic Colonization is rebuilt with beautifully improved visuals, while retaining the famous addic- tive gameplay and endless fun that are synonymous with Sid Meier games. • Establish A New Nation – Play as the English, Spanish, French or Dutch and journey to a brave new world in search of freedom from your oppressive homeland.